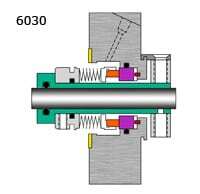 The 6030 & 6040 mechanical seal line is a single cartridge rotating metal bellows seal designed for general service in refinery, petrochemical, and chemical industries. The 6040 is provided with quench and drain ports as standard. Options include restriction bushing, lip seal or die formed graphite ring containment system.